As a child, I received this magazine as a part of a Publishers Clearing House subscription, I’m sure. I remember spending lots of time staring at the pages. I removed the posters, but my mother wouldn’t let us hang them. Basically these, like all of our books, became narfed up to the point of being trash worthy only. I love that I have a chance as an adult to re-visit what this was all about. 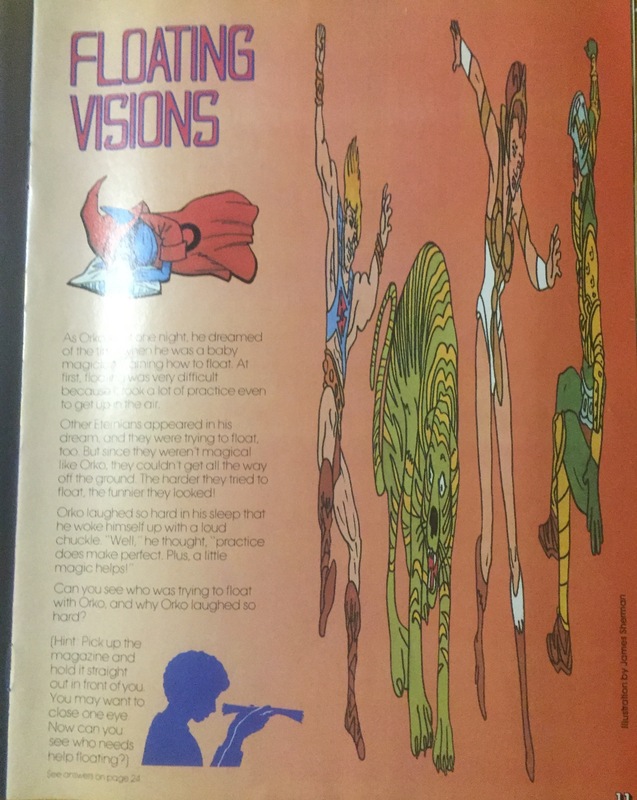 And as with all of my vintage comics reviews, I will also talk about the ads. 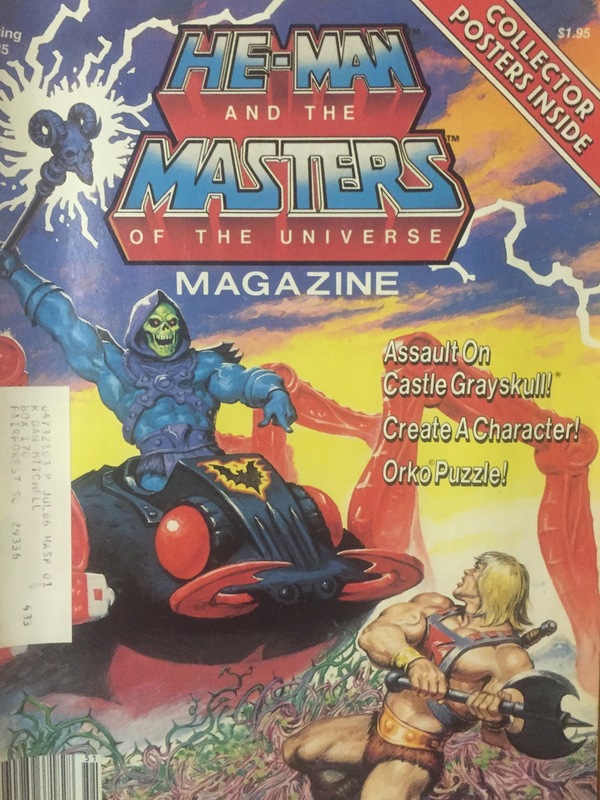 The cover of the book, (above) shows Skeletor and He-Man battling, with Skeletor prominently seated on Spydor. 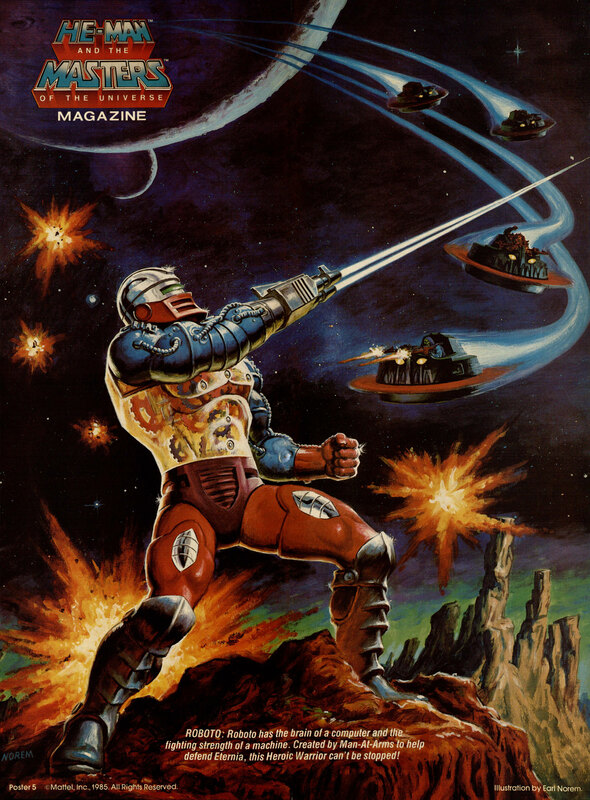 The cover is an Earl Norem painting…he did all of the covers for He-Man and the Masters of the Universe Magazines. (But not She-Ra.) He also did the posters that came inside. What you can’t see is Moss Man in the picture. The UPC code etc caused him to be cropped out. 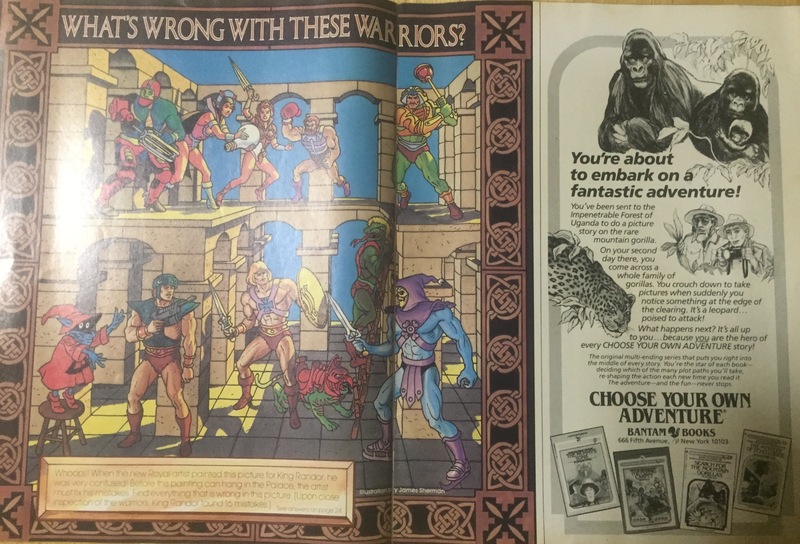 Turning the page, you are greeted with your first ad. 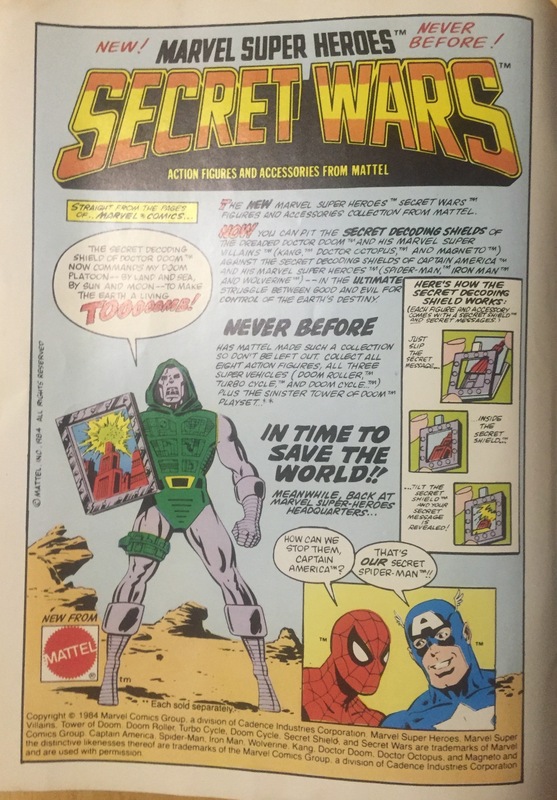 An ad for the SECRET WARS toys. I had a few of these as a kid. These were my introduction to Wolverine and to Spider-Man with a black costume. I had forgotten about the trick shield until recently, when the current Secret Wars comics printed variant covers that mocked these vintage toys. 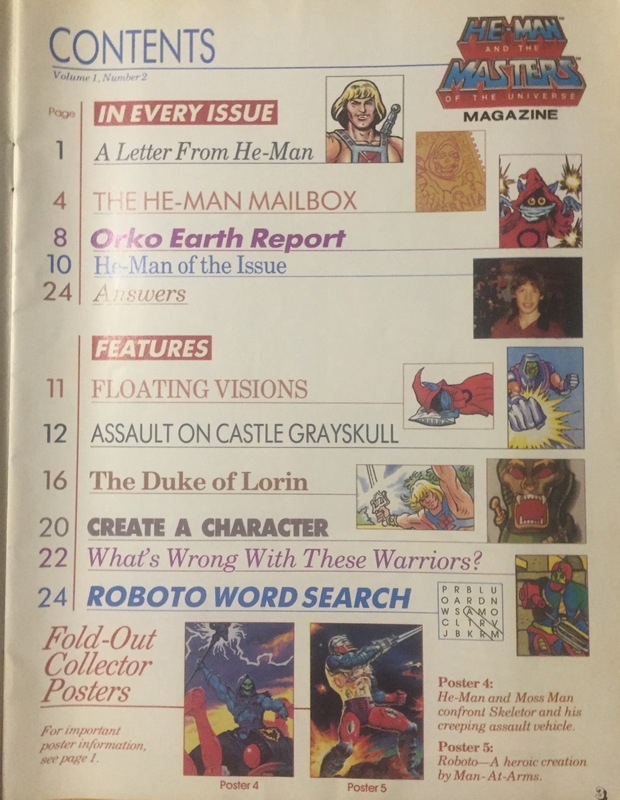 One thing about the MOTU magazine, it functioned as a sort of pseudo social network for He-Man fans. 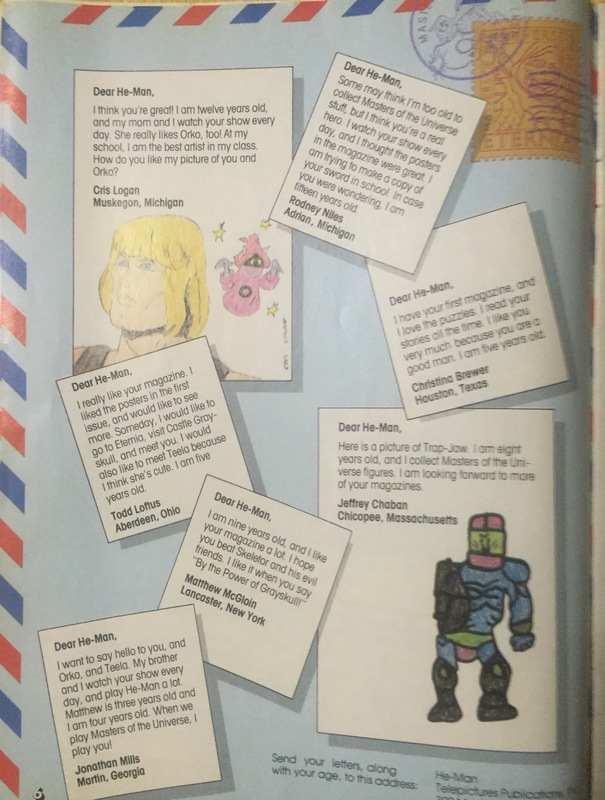 There are letters printed throughout the issue. 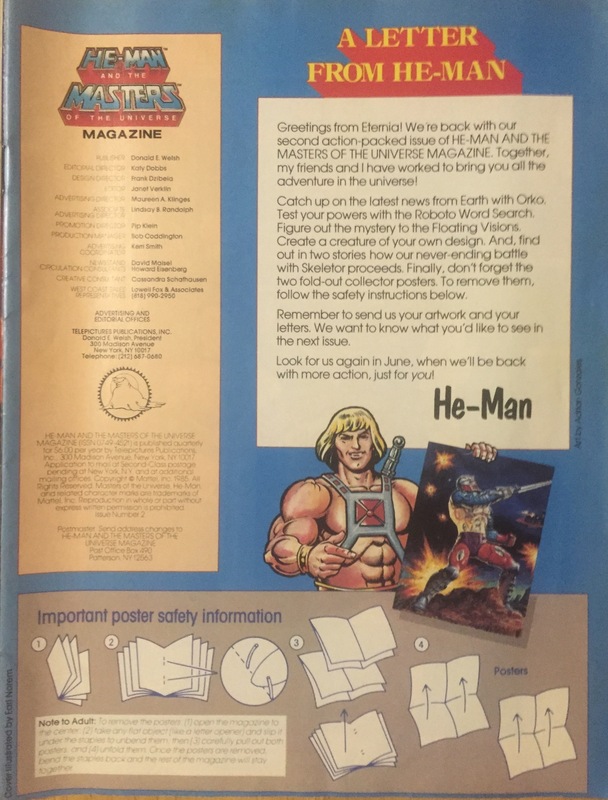 What better way to start a MOTU magazine than with a letter from He-Man himself? Here he just summarizes what’s ahead in the book. Then we get our next ad when we turn the page. 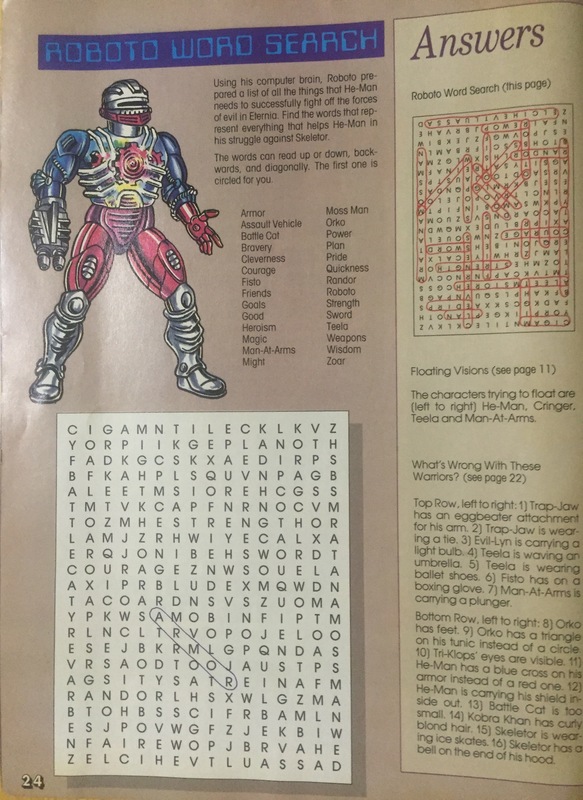 You are supposed to do this puzzle…so now we are removing pages, AND writing in our prized magazine. Total sacrilege. The official table of contents. This reminds me of the font list you see on a word processing program, like Microsoft Word or Apple’s Pages. Nowadays the font list tries to give you an idea of what the font looks like. Each line of the tale of contents contains a different color and font. In some classes about doing word processing, the teachers told us that we shouldn’t do this…that it is “tacky.” I guess a bunch of kids interested in Stinkor might not be so concerned about how “tacky” things look. Besides this, you can also see little snips of the art in the different sections of the book. This document pre-dates modern word processing. All of this would have been cut and pasted by hand. That’s impressive! Letters from the fans. Each one of these sings the praises of He-Man. 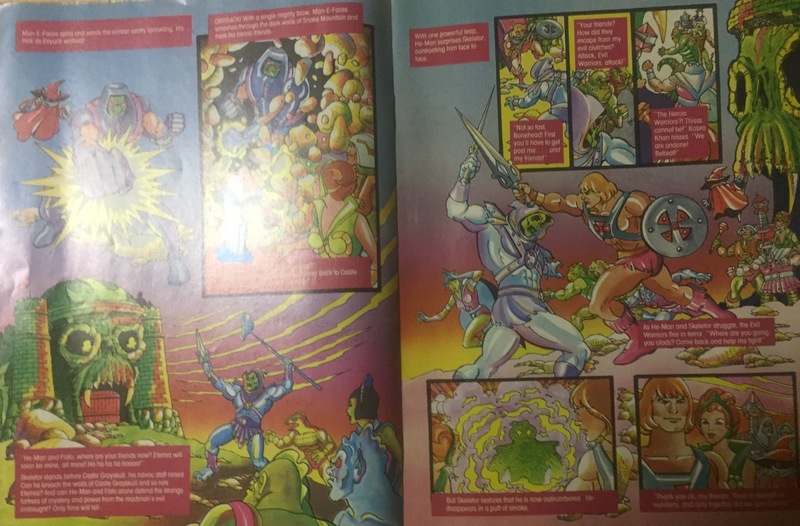 Many kids say something like they want to help He-Man defeat Skeletor. Some of them have kids art…quite an honor. We get a promotional ad for the magazine we are reading…. 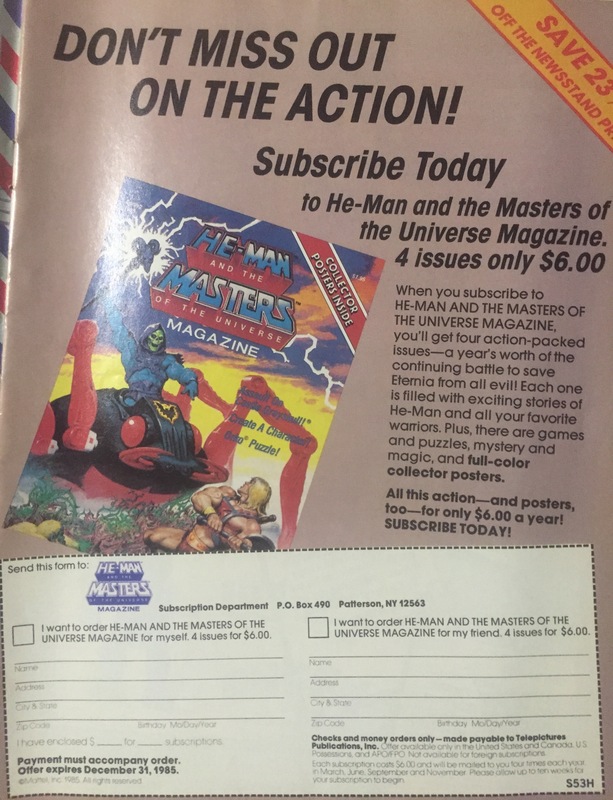 Four issues for $6.00. WOW! 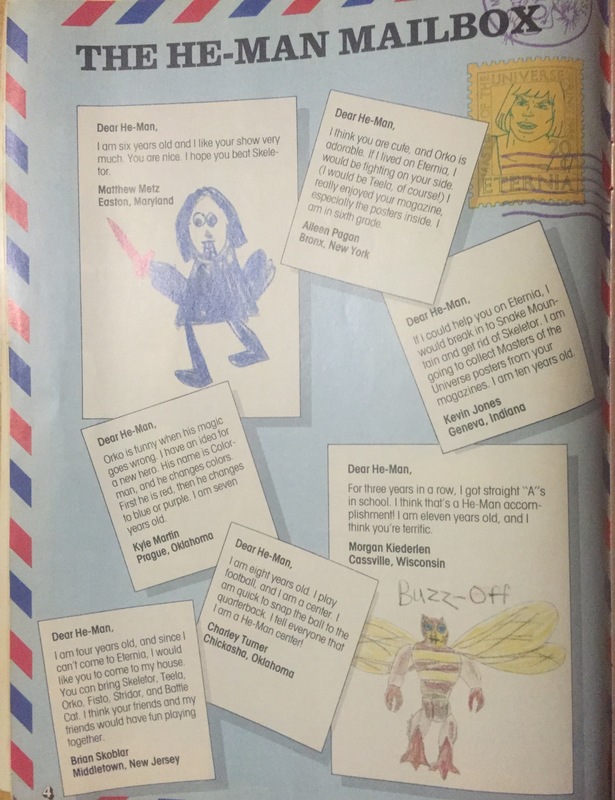 Some older kids wrote letters in on this page. One kid seems a little ashamed, mentioning that he is fifteen years old. That would make him about eight years older than the SpartanNerd. I hope he is still interested. Another ad. This one for Nerds. 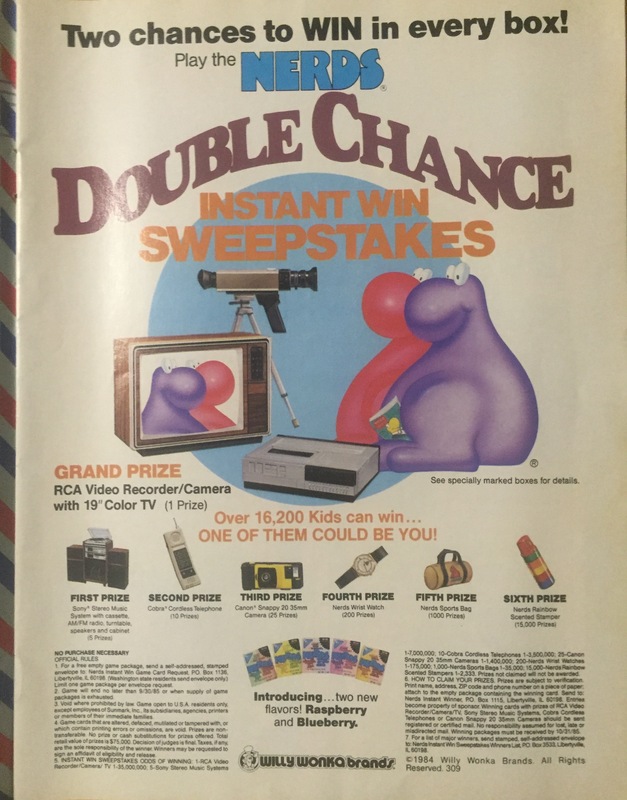 It features a contest. And REAL photos. I think its comical some of the prizes offered. First prize is a massive Sony stereo system, with a record player. Second prize is a CORDLESS PHONE. Third prize a canon camera that needed REAL FILM. Fourth prize a Nerds watch. With prize a bag. Sixth prize a Nerds stamp. 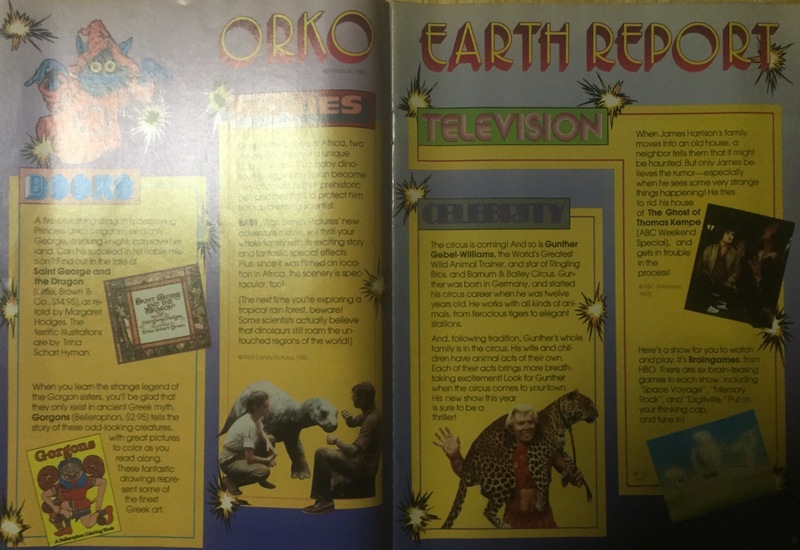 Here are some articles of interest for the kiddies. I have never seen the first book, or the second one. I’d forgotten about the movie “Baby.” I remember it being sad somehow at the end, however. Basically they find Baby stranded from its Brontosaurus mother. Light years before Jurassic Park. The animal trainer seems familiar. I don’t remember the ghost movie. Braingames. On HBO. This was early edutainment. This would evolve into Dora the Explorer and similar. Behind these pages we can see the poster. I am showing you that mine is still intact, and will remain that way! Here are digital images of the two posters. Floating Visions. 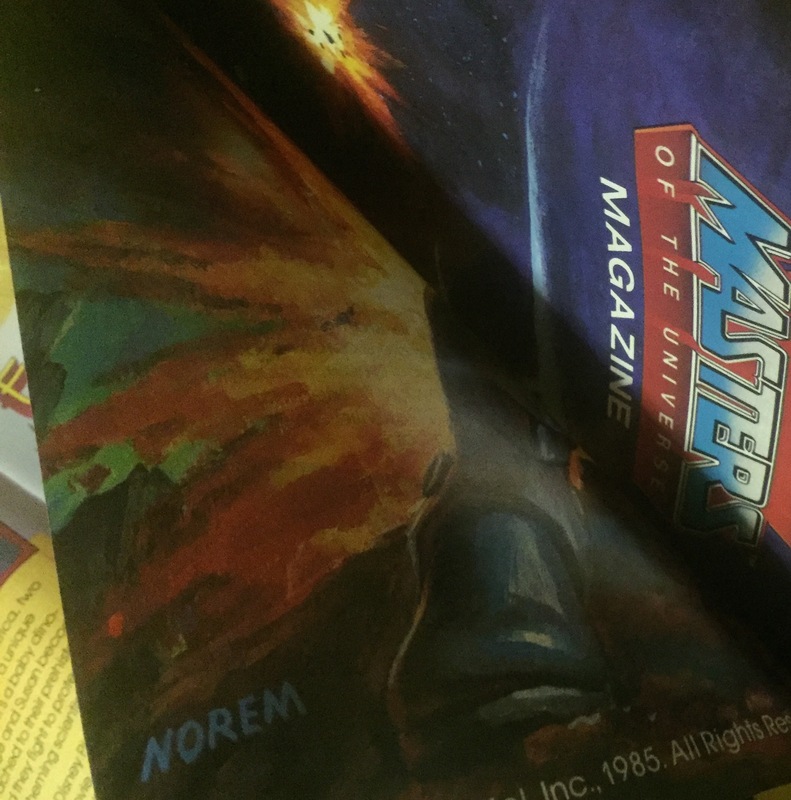 If you can’t tell what these are without tilting the magazine, maybe you are into the Thundercats instead…. A featured story. I would point out that some of this has poster behind it. So if you sacrifice the magazine for the poster, you lose some of the story. The artwork is interesting. 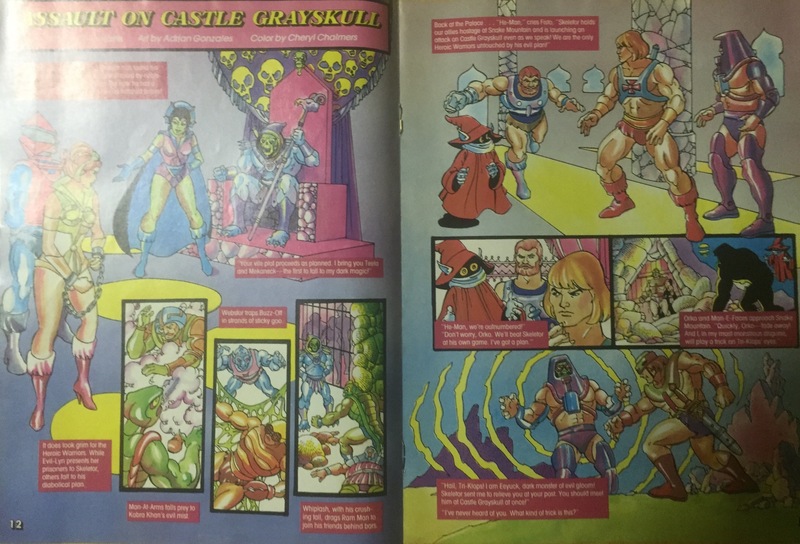 The color scheme here is more feminine than we usually see with He-Man stuff. 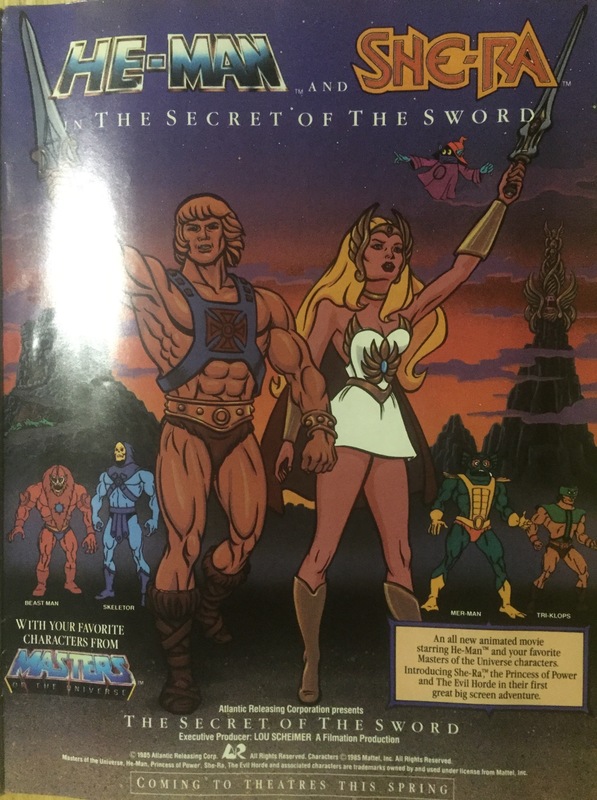 I wonder if this artist went on to color She-Ra books? This is a story that glosses over major details and skips to the point. Heroic warriors are captured. 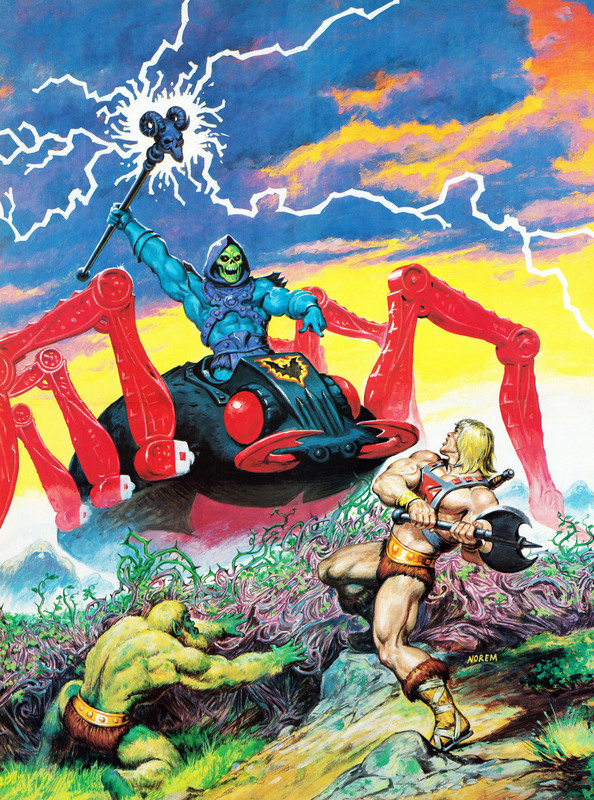 Skeletor attacks Grayskull. He-Man wins. As a teacher, I see something else now. The reading level of this story is on par with a seven year old. Important because of what follows. 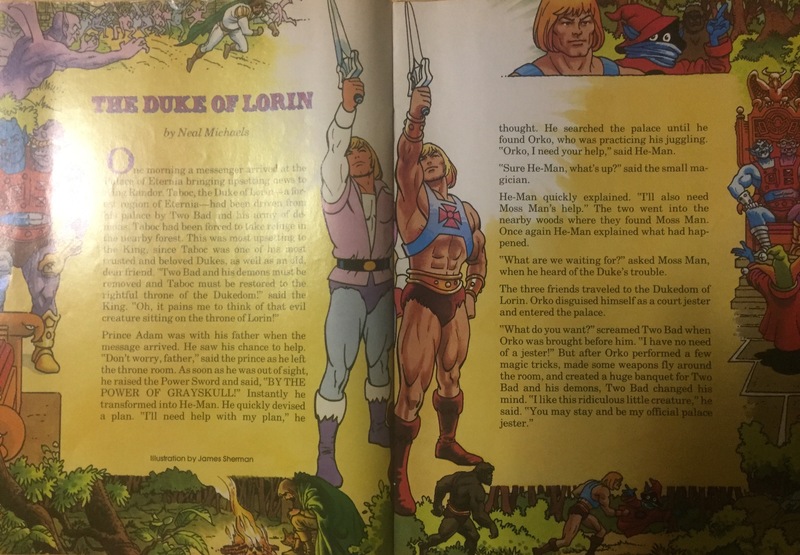 The Duke of Lorin is an almost fan-fiction short story. Not a graphic novel…this is meant for a higher reading level. Maybe an eleven or twelve year old. The border that surrounds the story is fantastic! As an adult looking in the rear view mirror, Create a Character means something else. 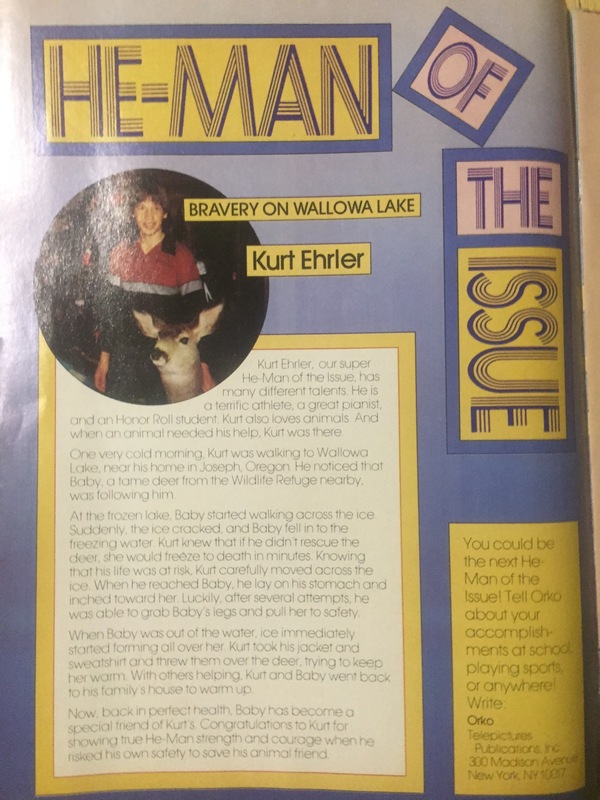 Mattel used this magazine to solicit kids to CREATE A CHARACTER near the end of the line. (Eventually we would have the Fearless Photog) The goofy feature here isn’t the same thing. It’s more of a paper-dolls activity. OK. 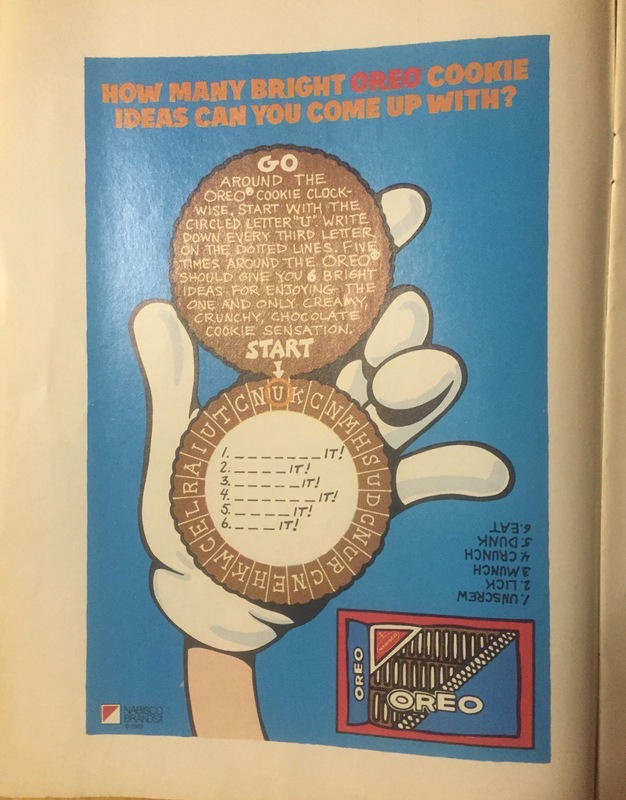 So we are supposed to write in the book to solve the OREO puzzle. Remove the posters. And now cut out pieces of paper doll. EEEK. The next feature got me at first. It appears to be a battle scene. 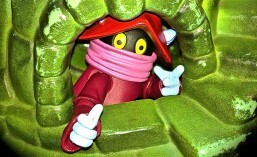 The kind of thing you see everyday on Eternia. But then you look closely and see how silly it is. 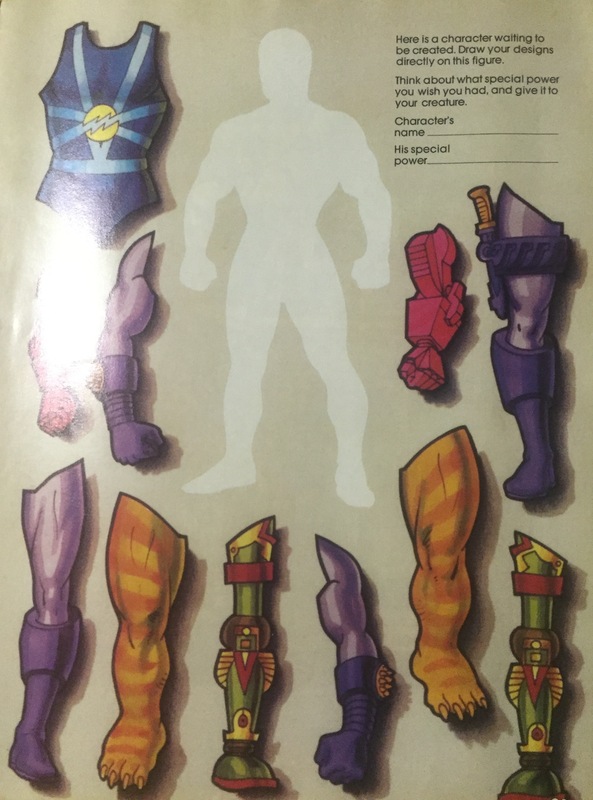 man-At-Arms has a plunger! Battle cat is a house cat sized animal. Evil-Lyn is carrying a LIGHT BULB. I’ll let you find the rest! There is another little ad. Choose Your Adventure. Another way to mutilate the book. Work this word-search. 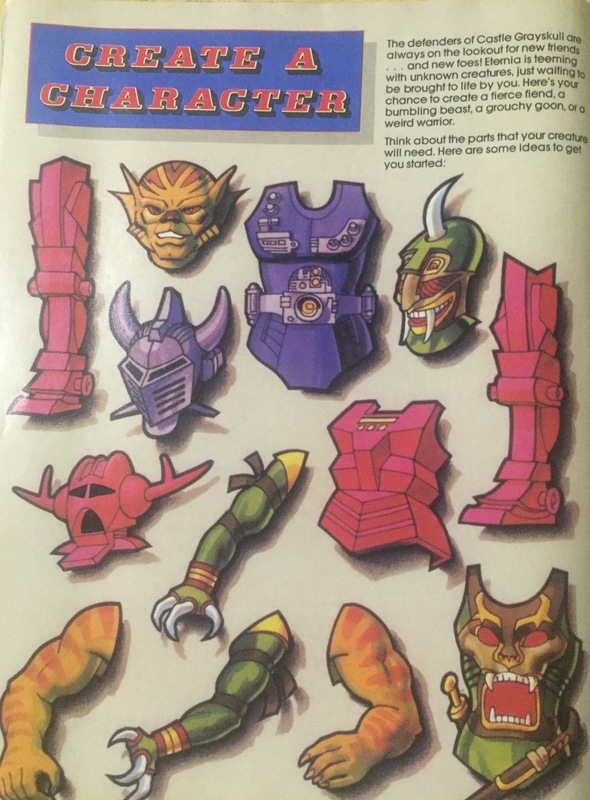 Notice that the Evil Horde gets a mention here, but the enemies featured are Skeletor’s baddies. 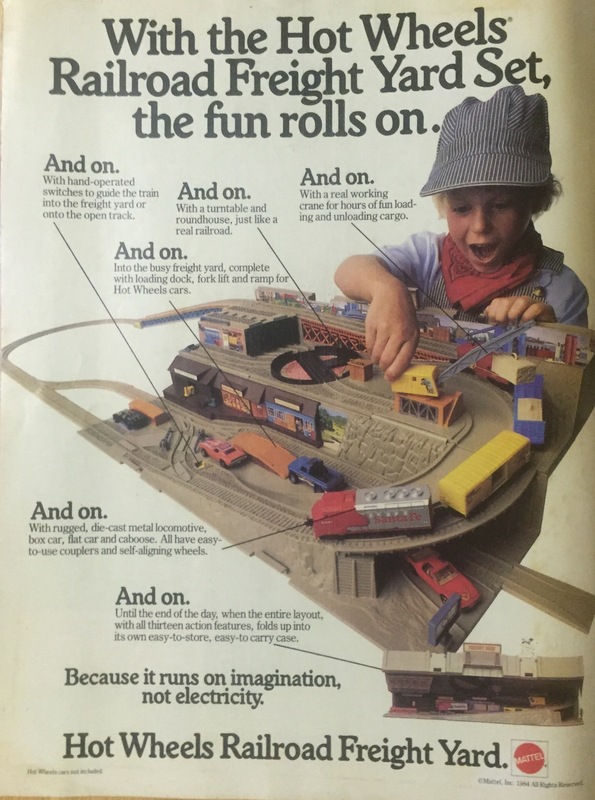 The back of the magazine has this ad for a hot-wheels train. No electricity required. This time a photo. It has something to do with being on the back cover, which is the same sheet as the front cover. The ad prominently attacks the electric train industry by pointing out how much better it is to roll the trains yourself by hand. You might not remember, but back in 1985, electric trains were all the rage with kids. Including the SpartanNerd. I mentioned that there was a little extra. This is the real thing! 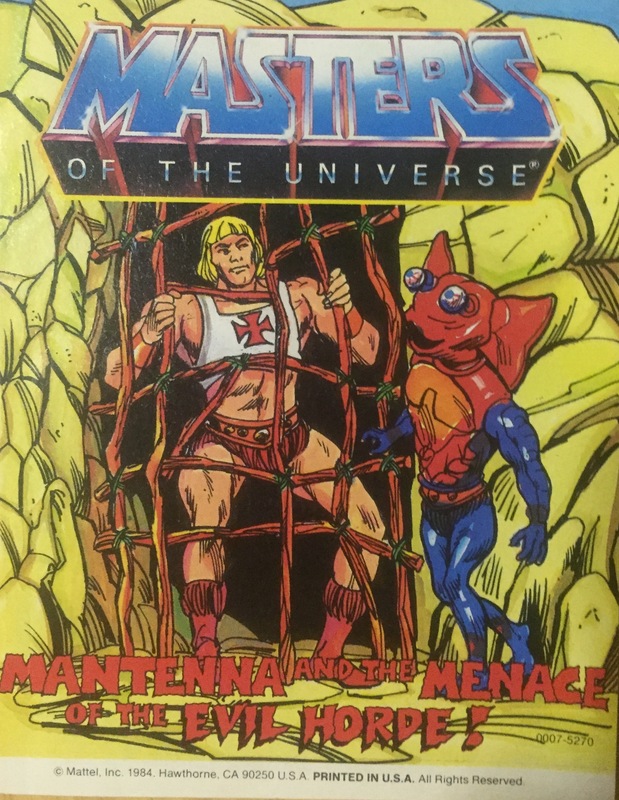 Manteca and the Menace of the Evil Horde! I really enjoyed my trip down memory lane. Thanks for reading, oh Hub-City Geeks.